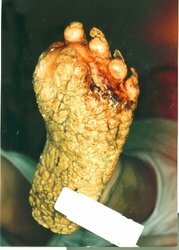 Palmoplantar keratoderma (PPK) is part of a group of disorders of the skin affecting primarily the palms of the hands and soles of the feet. It is characterized by thickening of the palms and the soles of individuals who are affected. The condition may be hereditary, acquired, or part of another disease with PPK as an associated feature.